An environmentally beneficial method of producing methanol from varied sources of carbon dioxide including flue gases of fossil fuel burning power plants, industrial exhaust gases or the atmosphere itself. Converting carbon dioxide by an electrochemical reduction of carbon dioxide in a divided electrochemical cell that includes an anode in one cell compartment and a metal cathode electrode in another cell compartment that also contains an aqueous solution comprising methanol and an electrolyte of one or more alkyl ammonium halides, alkali carbonates or combinations thereof to produce therein a reaction mixture containing carbon monoxide and hydrogen which can be subsequently used to produce methanol while also producing oxygen in the cell at the anode. This application claims the benefit of provisional application No. 60/949,723 filed Jul. 13, 2007, the entire content of which is expressly incorporated herein by reference thereto. A system for producing high purity hydrogen has been developed by steam reforming of methanol with a highly active catalyst, which allows operation at a relatively low temperature (240-290° C.) and enables flexibility in operation as well as rapid start-up and stop. These methanol-to-hydrogen (MTH) units, ranging in production capacity from 50 to 4000 m3 H2 per hour, are already used in various industries, including the electronic, glass, ceramic, and food processing industries, and provide excellent reliability, prolonged life span, and minimal maintenance. Operating at a relatively low temperature, the MTH process has a clear advantage over reforming of natural gas and other hydrocarbons which must be conducted at above 600° C., because less energy is needed to heat methanol to the appropriate reaction temperature. U.S. Pat. No. 5,599,638 discloses a simple direct methanol fuel cell (DMFC) to address the disadvantages of hydrogen fuel cells. In contrast to a hydrogen fuel cell, the DMFC is not dependent on generation of hydrogen by processes such as electrolysis of water or reformation of natural gas or hydrocarbon. The DMFC is also more cost effective because methanol, as a liquid fuel, does not require cooling at ambient temperatures or costly high pressure infrastructure and can be used with existing storage and dispensing units, unlike hydrogen fuel, whose storage and distribution requires new infrastructure. Further, methanol has a relatively high theoretical volumetric energy density compared to other systems such as conventional batteries and the H2—PEM fuel cell. This is of great importance for small portable applications (cellular phones, laptop computers, etc. ), for which small size and weight of energy unit is desired. In addition to use as fuels, methanol and methanol-derived chemicals have other significant applications in the chemical industry. Today, methanol is one of the most important feedstock in the chemical industry. Most of the 32 million tons of annually produced methanol is used to manufacture a large variety of chemical products and materials, including basic chemicals such as formaldehyde, acetic acid, MTBE (although it is increasingly phased out in the U.S. for environmental reasons), as well as various polymers, paints, adhesives, construction materials, and others. Worldwide, almost 70% of methanol is used to produce formaldehyde (38%), methyl-tert-butyl ether (MTBE, 20%) and acetic acid (11%). Methanol is also a feedstock for chloromethanes, methylamines, methyl methacrylate, and dimethyl terephthalate, among others. These chemical intermediates are then processed to manufacture products such as paints, resins, silicones, adhesives, antifreeze, and plastics. Formaldehyde, produced in large quantities from methanol, is mainly used to prepare phenol-, urea- and melamine-formaldehyde and polyacetal resins as well as butanediol and methylene bis(4-phenyl isocyanate) (MDI; MDI foam is used as insulation in refrigerators, doors, and in car dashboards and bumpers). Formaldehyde resins are predominantly employed as an adhesive in a wide variety of applications, e.g., manufacture of particle boards, plywood and other wood panels. Examples of methanol-derived chemical products and materials are shown in FIG. 1. Methanol can also be made from renewable biomass, but such methanol production also involves syn-gas and may not be energetically favorable and limited in terms of scale. As used herein, the term “biomass” includes any type of plant or animal material, i.e., materials produced by a life form, including wood and wood wastes, agricultural crops and their waste byproducts, municipal solid waste, animal waste, aquatic plants, and algae. The method of transforming biomass to methanol is similar to the method of producing methanol from coal, and requires gasification of biomass to syn-gas, followed by methanol synthesis by the same processes used with fossil fuel. Use of biomass also presents other disadvantages, such as low energy density and high cost of collecting and transporting bulky biomass. Although recent improvements involving the use of “biocrude,” black liquid obtained from fast pyrolysis of biomass, is somewhat promising, more development is needed for commercial application of biocrude. Ideally, S should be equal to or slightly above 2. 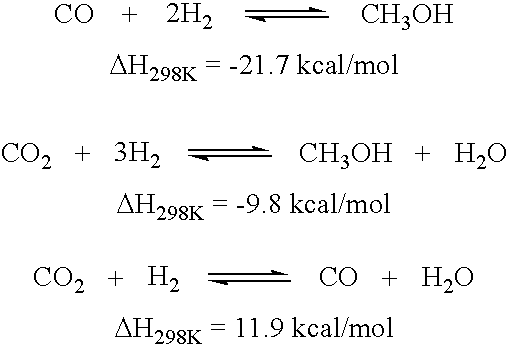 A value above 2 indicates excess hydrogen, while a value below 2 indicates relative hydrogen deficiency. Reforming of feedstock having a higher W/C ratio, such as propane, butane or naphthas, leads to S values in the vicinity of 2, ideal for conversion to methanol. When coal or methane is used, however, additional treatment is required to obtain an optimal S value. Synthesis gas from coal requires treatment to avoid formation of undesired byproducts. Steam reforming of methane yields syn-gas with a stoichiometric number of 2.8 to 3.0, and requires lowering the S value closer to 2 by adding CO2 or using excess hydrogen in some other process such as ammonia synthesis. However, natural gas is still the preferred feedstock for methanol production because it offers high hydrogen content and, additionally, the lowest energy consumption, capital investment and operating costs. Natural gas also contains fewer impurities such as sulfur, halogenated compounds, and metals which may poison the catalysts used in the process. The existing processes invariably employ extremely active and selective copper-based catalysts, differing only in the reactor design and catalyst arrangement. Because only part of syn-gas is converted to methanol after passing over the catalyst, the remaining syn-gas is recycled after separation of methanol and water. There is also a more recently developed liquid phase process for methanol production, during which syn-gas is bubbled into liquid. Although the existing processes have methanol selectivity greater than 99% and energy efficiency above 70%, crude methanol leaving the reactor still contains water and other impurities, such as dissolved gas (e.g., methane, CO, and CO2), dimethyl ether, methyl formate, acetone, higher alcohols (ethanol, propanol, butanol), and long-chain hydrocarbons. Commercially, methanol is available in three grades of purity: fuel grade, “A” grade, generally used as a solvent, and “AA” or chemical grade. Chemical grade has the highest purity with a methanol content exceeding 99.85% and is the standard generally observed in the industry for methanol production. The syn-gas generation and purification steps are critical in the existing processes, and the end result would largely depend on the nature and purity of the feedstock. To achieve the desired level of purity, methanol produced by the existing processes is usually purified by sufficient distillation. Another major disadvantage of the existing process for producing methanol through syn-gas is the energy requirement of the first highly endothermic steam reforming step. The process is also inefficient because it involves transformation of methane in an oxidative reaction to carbon monoxide (and some CO2), which in turn must be reduced to methanol. When hydrocarbons are burned they produce carbon dioxide and water. It is clearly of great significance, if this process can be reversed and an efficient and economic process can be found to produce methanol from carbon dioxide and water to be subsequently used for energy storage, fuels and production of synthetic hydrocarbons. In plant photosynthesis, carbon dioxide is captured from the air and converted with water and solar energy into new plant life. Conversion of plant life into fossil fuel, however, is a very long process. Thus, it is highly desirable to develop a process for chemical recycling carbon dioxide to produce hydrocarbons in a short, commercially feasible time scale. Carbon dioxide is known to be photochemically or electrochemically readily reduced to formic acid with formaldehyde and methanol being formed in only smaller amounts. Direct electrochemical reduction of CO2 into methanol under pressure also provides methyl formate. Catalytic hydrogenation of carbon dioxide using heterogeneous catalysts provides methanol together with water as well as formic acid and formaldehyde. As the generation of needed hydrogen is highly energy consuming, the production of methanol with equimolar amount of water as well as other side products from carbon dioxide is not practical. No efficient ways for the selective high yield, high selectivity economical conversion of carbon dioxide to methanol is presently known. The high selectivity laboratory reduction of carbon dioxide to methanol with complex metal hydrides, such as lithium aluminum hydride is extremely costly and therefore not suited for the bulk production of methanol. The invention relates to various embodiments of an environmentally beneficial method for producing methanol by reductive conversion of an available source of carbon dioxide including flue gases of fossil fuel burning power plants, industrial exhaust gases or the atmosphere itself. The method includes electrochemically reducing the carbon dioxide in a divided electrochemical cell that includes an anode in one cell compartment and a metal cathode electrode in another cell compartment that also contains an aqueous solution or aqueous methanolic solution and an electrolyte of one or more alkyl ammonium halides, alkali carbonates or combinations thereof to produce therein a reaction mixture containing carbon monoxide and hydrogen which can be subsequently used to produce methanol while also producing oxygen in the cell at the anode. While the electrode may be chosen from any suitable metal electrode, such as Cu, Au, Ag, Zn, Pd, Ga, Ni, Hg, In, Sn, Cd, Ti, Pb, and Pt, preferably the metal electrode is a gold electrode. The metal electrode acts as a catalyst for the electrochemical reduction. FIG. 2 schematically illustrates the METHANOL ECONOMY™ process. Carbon dioxide is preferably obtained from concentrated point sources of its generation prior to its release into the atmosphere. Carbon dioxide can, however, also be obtained by separating atmospheric carbon dioxide with a suitable adsorbent followed by desorption treatment to release the adsorbed carbon dioxide therefrom, as disclosed in PCT Application No. WO 2008/021700. This can be achieved by heating to release the adsorbed carbon dioxide, by treating it under reduced pressure or by a suitable combination of both. It has further been discovered that the electrochemical reduction of CO2 using nobel metal, preferentially a gold electrode as a catalyst in aqueous methanol (or in water) with tetrabutylammonium halides and alkali carbonates as electrolytes not only gives CO but also H2 at the cathode, while producing oxygen gas (O2) at the anode. Suitable tetrabutylammonium halides for use in the present invention include tetrabutylammonium bromide, tetrabutylammonium chloride, and tetrabutylammonium iodide. Tetraalkyl ammonium salts are known to promote one electron reduction of CO2. CO2 emissions from fossil fuel burning power plants and varied industries including geothermal wells can be captured on-site. Separation of CO2 from such exhausts is well-developed. The capture and use of existing atmospheric CO2 allows chemical recycling of CO2 as a renewable and unlimited source of carbon. CO2 absorption facilities can be placed proximate to a hydrogen production site to enable subsequent methanol synthesis. When the processes of the invention utilize carbon dioxide from the atmosphere, the carbon dioxide can be separated and absorbed by using various processes as described in published PCT Application No. WO 2008/021700 and U.S. Pat. No. 7,378,561 or can be recycled chemically as described in published US Patent Application Nos. 2006/0235091 and 2007/0254969. Although the CO2 content in the atmosphere is low (only 0.037%), the atmosphere offers an abundant and unlimited supply because CO2 is recycled. For using atmospheric carbon dioxide efficiently, CO2 absorption facilities are needed. This can be addressed by using efficient CO2 absorbents such as polyethyleneimines, polyvinylpyridines, polyvinylpyrroles, etc., on suitable solid carriers (e.g., active carbon, polymer, silica or alumina), which allow absorbtion of even the low concentration of atmospheric CO2. CO2 can also be captured using basic absorbents such as calcium hydroxide (Ca(OH)2) and potassium hydroxide (KOH), which react with CO2 to form calcium carbonate (CaCO3) and potassium carbonate (K2CO3), respectively. CO2 absorption is an exothermic reaction, which liberates heat, and is readily achieved by contacting CO2 with an appropriate base. After capture, CO2 is recovered from the absorbent by desorption, through heating, vacuum (or reduced pressure) or electrochemical treatment. Calcium carbonate, for example, is thermally calcinated to release carbon dioxide. As desorption is an endothermic, energy-demanding step, the appropriate treatment can be chosen to optimize absorption and desorption with the lowest possible energy input. Thus, CO2 can be recycled by operation of absorbing-desorbing columns in convenient cycles with modest heating and/or under reduced pressure to cause desorption of CO2 to take place. When methanol, methanol-derived fuels or synthetic hydrocarbons are combusted (oxidatively used), they release CO2 and water, thus providing the basis methanol cycle, the artificial version of the natural recycling of CO2 through photosynthesis. In contrast to the nonrenewable fossil fuel sources such as oil, gas, and coal, recycling carbon dioxide from industrial and natural sources to produce methanol not only addresses the problem of diminishing fossil fuel resources, but also helps alleviate global warming due to greenhouse effect. Methanol and/or dimethyl ether can also be conveniently converted in a single catalytic step to ethylene and/or propylene (e.g., in a methanol to olefin or “MTO” process), the building blocks for producing synthetic hydrocarbons and their products. This means that the hydrocarbon fuels and products currently derived from oil and natural gas can be obtained from methanol, which itself can advantageously be obtained from simple chemical recycling of atmospheric or industrial CO2 sources. Another utilization of methanol is its ready conversion to ethanol via hydration of derived ethylene. Many further applications are known and can be applied to carbon dioxide derived methanol. It should be emphasized that there is no preference for any particular energy source needed for producing methanol. All sources, including alternative sources and atomic energy can be used. Energy once produced must be, however, stored and transported, for which methanol is well suited. The improved and efficient selective conversion of carbon dioxide, which can be from atmospheric or industrial exhaust sources, to methanol according to the present invention also provides the needed raw material for what the inventors have termed the METHANOL ECONOMY™ process. This allows convenient storage and transport of energy in a liquid product that can be used as a fuel in internal combustion engines or in fuel cells and as a starting material for synthetic hydrocarbons and their varied products. The METHANOL ECONOMY™ process is based on the efficient direct conversion of still available natural gas resources to methanol or dimethyl ether, as disclosed in U.S. Publications Nos. 2006/0235088 and 2006/0235091, and 2007/0254969 as well as the presently disclosed reductive chemical conversion of carbon dioxide. The concept of the METHANOL ECONOMY™ process presents significant advantages and possibilities. In the METHANOL ECONOMY™ process, methanol is used as (1) convenient energy storage medium, which allows convenient and safe storage and handling; (2) readily transported and dispensed fuel, including for methanol fuel cells; and (3) feedstock for synthetic hydrocarbons and their products currently obtained from oil and gas resources, including polymers and even single cell proteins, which can be used for animal feed or human consumption. The environmental benefits obtained by disclosed chemical recycling of carbon dioxide results in mitigating the global warming to ensure the well being of future generations. The disclosed new efficient production of methanol from industrial or natural carbon dioxide sources, or even from the air itself, provides the needed raw material for replacing the diminishing fossil fuel through the METHANOL ECONOMY™ process. The conversion of carbon dioxide to methanol necessitates significant energy, which can be, however, provided by any energy source including offpeak electric power of fossil fuel (e.g., coal) burning power plants, atomic energy or any alternative energy sources (solar, wind, geothermal, hydro, etc.). The reduction of CO2 to methanol allows storage and transportation of energy in a convenient liquid product (i.e., methanol) more convenient, economical and safe than volatile hydrogen gas. Methanol and/or dimethyl ether are efficient fuels in internal combustion engines or in direct oxidation methanol fuel cells (DMFC as well as raw materials for olefins, synthetic hydrocarbons and varied products). The present invention greatly extends the scope of the utilization of carbon dioxide for the production of methanol and/or dimethyl ether from natural or industrial sources, even from the air itself. In a divided electrochemical cell, using, aqueous 0.1M KHCO3 as the electrolyte CO2 is reduced at the gold cathode at −3.2V vs. Ag/AgCl reference electrode CO2 is reduced and water is electrolyzed to an optimal 1:2 mixture of CO and H2 suitable for methanol synthesis. The total faradaic efficiences for CO and H2 production add up to 100%. Pure oxygen is produced at the anode. 1. A method of producing methanol by reductive conversion of any available source of carbon dioxide, which comprises electrochemically reducing the carbon dioxide in a divided electrochemical cell comprising an anode in one cell compartment and a metal cathode electrode in another cell compartment that also contains an aqueous solution or aqueous methanolic solution of an electrolyte of one or more alkyl ammonium halides, alkali carbonates or combinations thereof to produce therein a reaction mixture containing carbon monoxide and hydrogen which can be subsequently used to produce methanol while also producing oxygen in the cell at the anode. 2. The method of claim 1 wherein the carbon monoxide and hydrogen gas are obtained in the reaction mixture in a ratio of at least about 1:2 or with excess amounts of hydrogen gas. 3. The method of claim 1 which further comprises reacting carbon monoxide and hydrogen from the reaction mixture to produce methanol, wherein the carbon monoxide and hydrogen gas are present in the reaction mixture in a ratio of 1:2 to 1:2.1. 4. The method of claim 1, wherein the electrolyte comprises one or more multi-alkyl ammonium halides, one or more alkali carbonates or bicarbonates and methanol or water. 5. The method of claim 4, wherein the multi-alkyl ammonium halide(s) include tetrabutylammonium halide(s). 6. The method of claim 5, wherein the tetrabutylammonium halide(s) are selected from the group consisting of tetrabutylammonium bromide, tetrabutylammonium chloride, tetrabutylammonium iodide or mixtures thereof. 7. The method of claim 1, wherein the alkali carbonates include sodium or potassium bicarbonates. 8. The method of claim 1, wherein the metal electrode is a Cu, Au, Ag, Zn, Pd, Ga, Ni, Hg, In, Sn, Cd, Tl, Pb or Pt electrode. 9. The method of claim 8, wherein the metal electrode is a gold electrode. 10. The method of claim 1, wherein the electrochemical reduction includes applying a voltage of from −1.5 to −4 V with respect to a Ag/AgCl reference electrode. 11. The method of claim 1, which further comprises obtaining the carbon dioxide from an exhaust stream from a fossil fuel burning power or industrial plants, from a source accompanying natural gas or from geothermal wells. 12. The method of claim 1, which further comprises obtaining the carbon dioxide source from the atmosphere by absorbing atmospheric carbon dioxide onto a suitable adsorbent followed by treating the adsorbent to release the adsorbed carbon dioxide therefrom. 13. The method of claim 12, wherein the adsorbent is treated by sufficient heating or by subjecting the adsorbent to sufficient reduced pressure to release the adsorbed carbon dioxide. 14. The method of claim 1, wherein electrical energy for the electrochemical reduction of carbon dioxide is provided from a conventional energy source based on nuclear, hydroelectric, wind, geothermal or solar power.